Today is Pi Day! I just love this fake holiday. Even though the date 3.14 is a reference to the mathematical pi, I think it is fun that people celebrate by eating pie! Instead of making a dessert pie, I thought I would share a recipe for a savory pie! 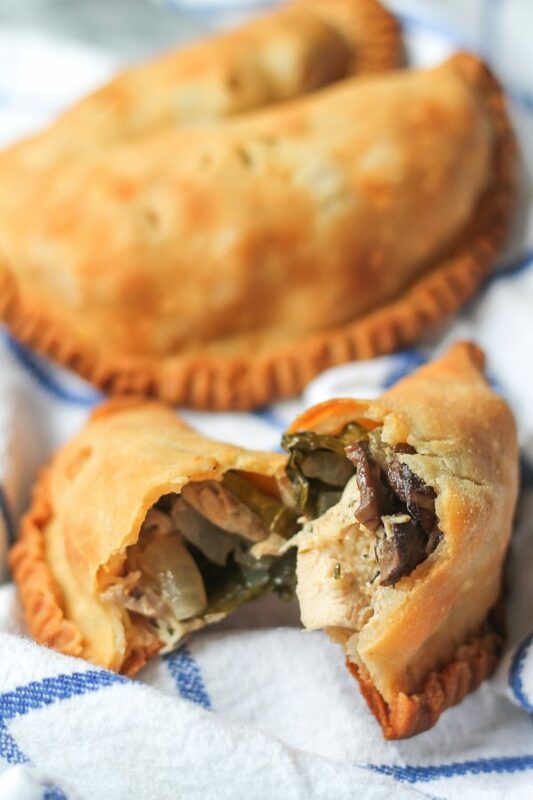 These Chicken and Vegetable Hand Pies are a fantastic weekend lunch that can quickly be prepared with leftover chicken or a rotisserie chicken from the grocery store. 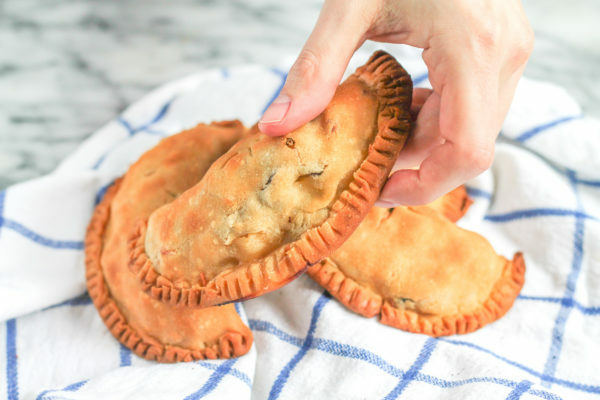 They are a full meal in a handheld pie, and they are pretty darn cute too. 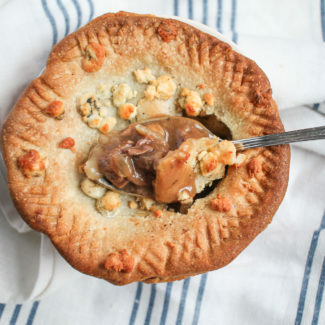 Store-bought pie crust is cut into circles and then filled with chicken, mushrooms, onions, carrots, cheddar cheese, and spinach. The chicken and vegetables are cooked in a light white wine sauce that keeps the chicken moist. 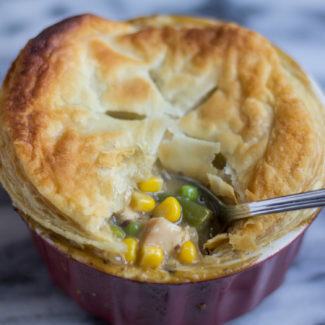 The chicken filling is similar to a chicken pot pie filling, but with less liquid. 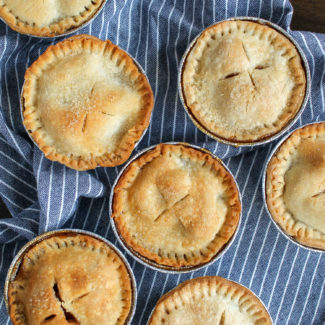 I love using store-bought pie crust – it tastes just as good as homemade, and it saves you time! Just make sure that you purchase pie crust packaged in rolls for this recipe. 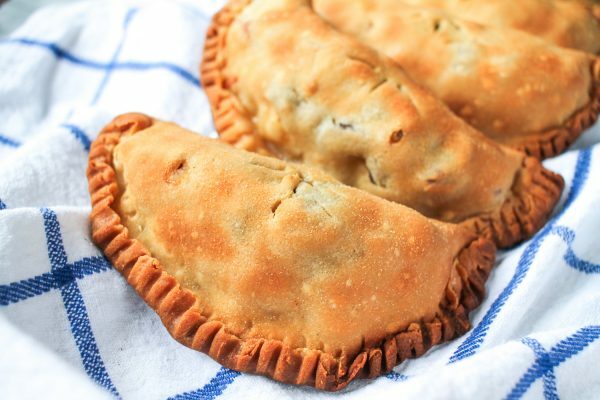 These hand pies can be prepared in under an hour. It takes about 15 minutes to prepare the pie filling, and the pies bake for just about 25 minutes. 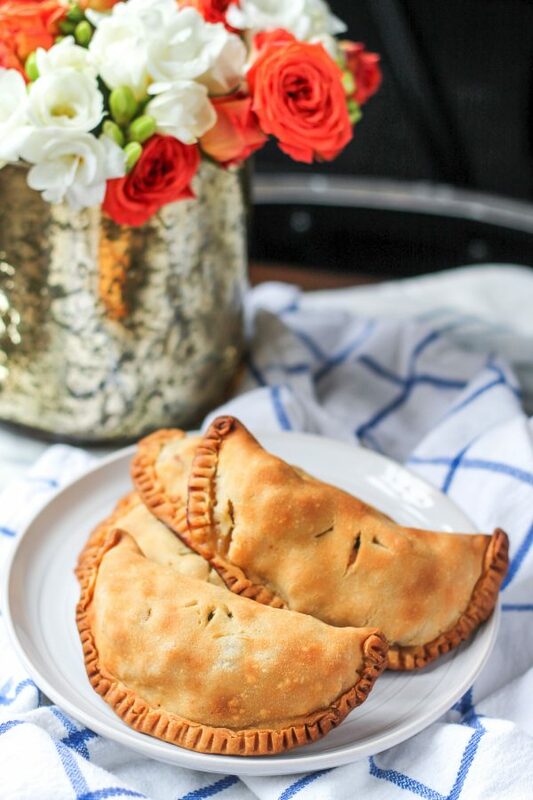 One batch makes 5-6 hand pies – enough to for a whole family, or enough to eat for lunch for a few days! 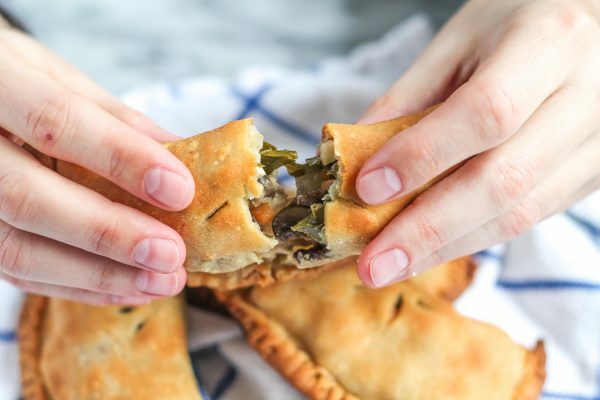 There is a little trick to assembling the hand pies. Don’t just pinch the pie crust together, fold it over and then seal it by pressing it with a fork. This will make sure that the filling all stays inside the hand pie while it bakes. You don’t want the cheese to melt out! 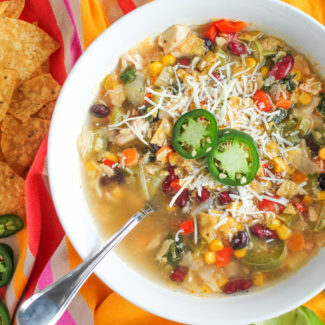 If you want even more recipes for leftover chicken and rotisserie chicken, you can check out this collection of recipes. Start by melting the butter in a skillet over medium heat. Once melted, add the mushrooms and season with salt and pepper. Saute the mushrooms for 4 minutes, then add the onion and carrot and cook for another 3 minutes. Add the chicken stock, white wine, chicken, thyme, and tarragon. Let simmer for 5-7 minutes, until most of the liquid has been absorbed. Let cool while you prepare the pie crust. Unroll the pie crusts, and use a bowl about 5 inches in diameter to cut two circles from each of the pie crusts. Roll out the remaining pie crust and cut a fifth circle. You might even have enough dough for a 6 hand pies - go for it! Now it is time to assemble the hand pies. 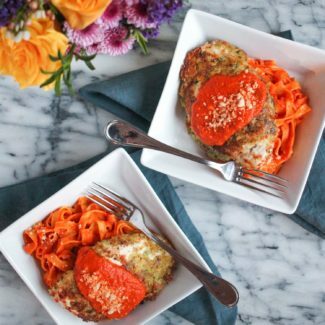 Start with a small handful of spinach, and then add about 1/4 cup of the chicken filling. 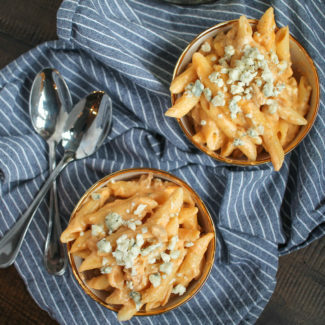 Top with a small handful of cheddar cheese. Then carefully fold the dough in half. Press the edges together and fold them up, then use a fork to seal the edges. Repeat using all of the dough. If you have a silpat, I recommend using it. Arrange the handpies on a pan and place then in the oven to bake. After 20 minutes, remove the pies from the oven and brush them generously with olive oil. Then return then to the oven for another 5 minutes, or until golden brown.